The Plan Station is a heavy duty, portable, standing desk and workstation that provides an instant and efficient place to work for building sites, home offices, garages, workshops, or any place where portable workspace is needed. Folds up and installs at any height. Easily hangs wherever your work takes you. Simply install 2 pieces of 24" x 48" x 1/2" plywood (not included), hang it on the wall, open it up and you have an instant workspace with a variety of storage compartments for files, folders, tablets, mail, business cards, pens, calculator, cell phone and even a Drink holder. Constructed of rugged fabric. Includes heavy-duty rings placed at 48" center for quick installation and durability. Dowel inserts allow for free standing applications. Wire access slots for cords. Desk space fits 24" x 36" blueprints. Includes Plan Station only; cords, blueprints, pens, folders, cups, etc. Are not included. Portable workstation: create your own heavy-duty desk anywhere and stay organized while maintaining maximum flexibility. This item easily folds and stores away to save space. US patent # 7, 421, 958. Standing desk: heavy duty, effective, affordable standing desk for the construction site, garage, Office, home or practically anywhere! requires 2 pieces of 1/2" plywood at 24"x48". 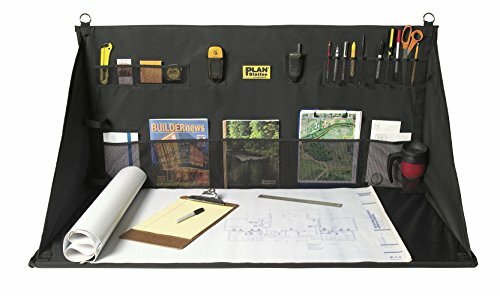 Heavy duty functionality: with over 20 pockets and room enough for blueprints and other essentials, the Plan Station 48 inch width helps you get the job done! Strong and reliable: made from strong nylon fabric and heavy duty rings ready to support you and your work anywhere! Easy to use: heavy duty, portable, hangs in seconds, easily adjustable, and strong enough to support your Supplies. The Plan Station is your go to portable, standing desk. If you have any questions about this product by Plan Station, contact us by completing and submitting the form below. If you are looking for a specif part number, please include it with your message.